For information about potential effects and treatments, see the page "If you are hit by a laser beam." The page's text concentrates on consumer injuries and concerns from exposure to relatively low-powered laser pointers and handhelds, and from exposure at laser light shows. In addition, the page also has useful descriptions, links and resources regarding injuries and concerns in industrial, research, military, etc. 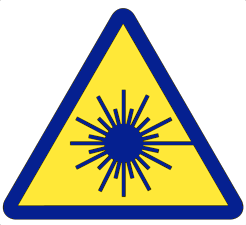 settings, from all types of hazardous lasers.